"Hot Pot" or "Steamboat" 火锅, isn't it simply a meal of cooking a variety of ingredients in a pot of simmering broth set at the table top? 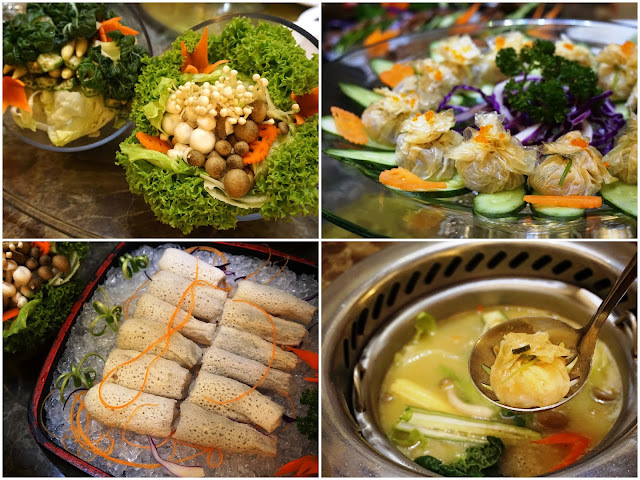 Apparently, there is more to it, as we tucked into the "Duo Lao" 豆捞 cuisine that is supposedly widely acknowledged as the "royals" of hot pots in modern China because it focuses on improving one's health and vitality through food. In Singapore, Fu Lin Men 福临门 (which symbolizes fortune bestowed upon one's home) along North Canal Road is the place to go to for a taste of this "duo lao hot pot" experience. Its corner shophouse premises spawns over 3 storeys with a 220-seater capacity and has 7 private rooms, certainly one of the bigger hot pot restaurants we can find locally. The decor is also definitely classier than the usual hot pot joints. 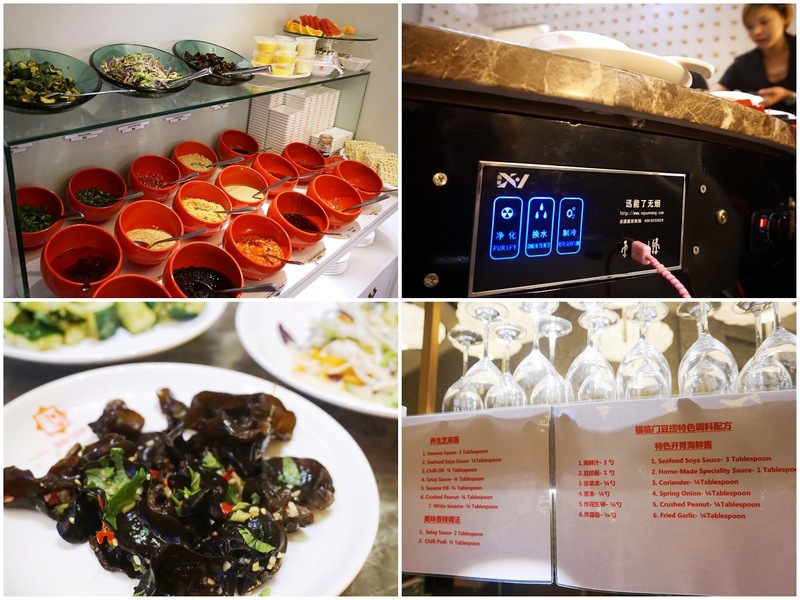 Each table is fitted with personal hot pots complete with its individual temp-control knobs, perfect for hygiene-OCD folks and those who are not comfortable with communal dining. Yes, do bring your cable too if you wish to power charge your electronic devices while fueling up your body. 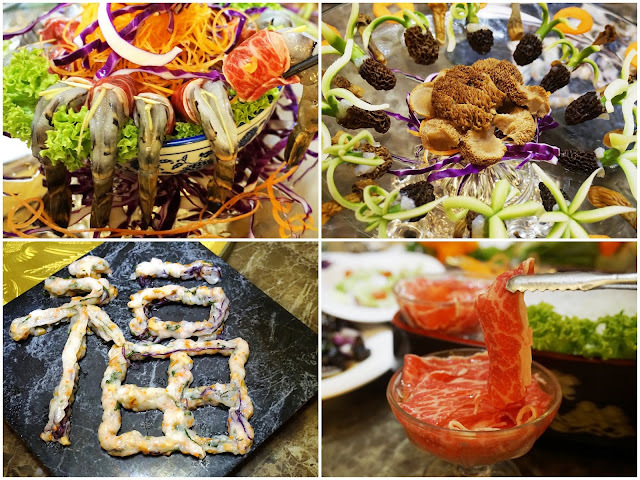 Fu Lin Men prides itself in the use of quality ingredients for its broth and the platters of freshly harvested meat, greens and seafood. Let us start with the soup base which comprise of 5 options created and named after the elements in the ancient study of feng shui: Gold-Signature Golden Imperial ($10), Wood-Mushroom ($6), Water-Tofu ($6), Fire-Sizzling Chili ($7), and Earth-Tomato ($6) . It was a no-brainer choice for me as I indulged in Fu Lin Men's Signature Golden Imperial broth. Brewed for over 12 hours with fresh red carrot puree, chicken bone marrows, pork shin and thigh with skin and dry-aged cured ham, each spoonful was wondrously luscious and I can imagine myself benefiting from the skin-boasting collagen within. The more ingredients we add as we progress into the hot pot goodness will undoubtedly enrich the broth's taste further. To give you a sense of what's available on the ala-carte menu and its prices: Wild Bamboo Pith with Fresh Prawn Paste ($10/$18), Assorted Tofu Platter ($6), Oriental Greens, Wild & Cultivated Mushrooms ($10), Morel, Matsutake & Lion's Mane Mushroom Platter ($28), Premier Oxtail ($6/$10), Beef & Lamb Platter ($38), Seafood Combo Platter ($35), Sliced Fish ($12), Tiger Prawns ($6/$10), Live Prawns ($18), Live Grouper ($58). Set Meal are also available for 2-Pax ($68/$98) and 4-Pax ($138/$198). Lunch Set is at only $16.80! The Beer-marinated Beef ($28) was especially pleasing. Though I usually prefer to savor my beef as unadulterated as possible, a brief dip into the beer before dunking it into the broth infused the meat with a different level of enjoyment. Of course, the golden rule when cooking beef is to never over-cook it for a tender bite. Which is why the elaborately-presented Freshly-cultured Sea Prawn with Marbled Beef ($18) was quite a challenge as both meats require different cooking time to bring out its optimal texture. I'm not a huge fans of balls, but if you are, the Handcrafted Meat Balls (assorted flavors, $7/$12) would be worth a try. The meat balls are not what one would typically expect, but dominated by interesting flavors including Prawn with Golden Roe, Beef with Cheese, Pork with Water Chestnut & Black Fungus, Seafood with Golden Mushroom, Squid with Spinach, and even..... Squid with Chocolate! My choice would be the Fresh Beancurd Pockets with Fresh Seafood Paste ($10). Fu Lin Men also serves several rice dishes such as Shitake Mushroom Rice ($8) and Scallop Rice ($12). The Fortune Chalice ($38) that we feasted upon was one which luxuriated with premium sea cucumber, abalone and mushroom mixed with rice in a delectable gravy. But to end with sweet Pineapple Glutinous Rice ($9) or the excessively starchy Grand Imperial Premium Bird's Nest ($28) can be rather heavy for dessert though it came highly recommended. My pick would be the fresh cut fruits that is placed along with the appetizers at the condiments bar. Perfect for cleansing the palate after the Fu Lin Men duo lao experience.